Thunder Polish Glass Crystal rondelles are considered the highest quality Chinese Crystal beads on the market. These beautiful 6x4mm rondelles are hand-cut and polished and come in a dazzling array of brilliant colors and finishes. 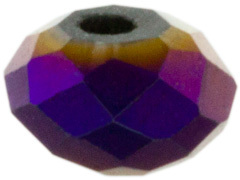 Thunder Polish crystal rondelles are an excellent, lower cost alternative to Swarovski and Preciosa crystals and the line is constantly growing to include more vibrant colors. If you like a lot of bling, try our gorgeous, sparkling Thunder Polish crystal rondelles!